The Catholic Church provides a process for formation in the Catholic Christian way of life called the Rite of Christian Initiation of Adults (R.C.I.A.) This process is for unbaptized adults and children (over the age of seven.) It is a gradual process inviting an individual to learn and understand the teachings of the Catholic Church. During the process people have the opportunity to ask questions about the Church and study Jesus’ message of salvation and learn how Catholics try to live out that message. Adults seeking to become Catholic, who were validly baptized in another Christian denomination, do need an understanding of Catholic beliefs and the liturgical life of Church before making a commitment to the Catholic Church. Each person’s situation is evaluated and his/her needs are met in an appropriate way. 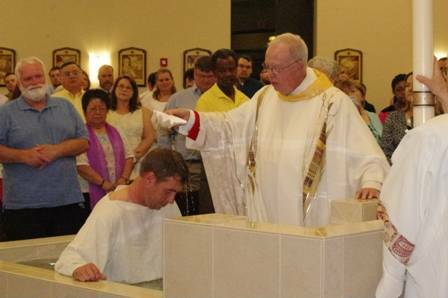 Adults who were baptized Catholic but never celebrated the Sacraments of Confirmation or First Eucharist are also invited to join us. If you are interested in exploring the Catholic way of life and would like more information, contact Deacon George Mills at 210-7866 .